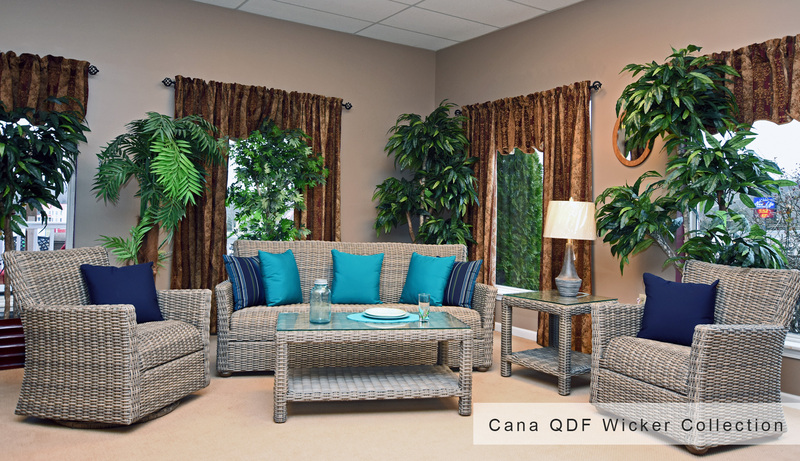 CANA QDF (Quick Dry Foam) Outdoor Resin Wicker Collection WOW! What can we say? This set has a unique surprise in store for anyone tempted to try something different! The seat looks rounded and slightly hard but that's not the case as you sit you will be pleasantly surprised at the comfortable give as if there is something inside that is hidden from view, and indeed it is. This set features a Quick Dry Cushion inside under the Wicker Weave, it gives as you sit, no sliding cushions to worry about or to put away every time you go indoors or weather is in the forecast. And it's Comfortable! You will love it and your guest will too! The set also features Outdoor Resin Wicker Woven Over a Heavy Duty Aluminum Frame. Sturdy and completely Durable. Included is a 3 year warranty.